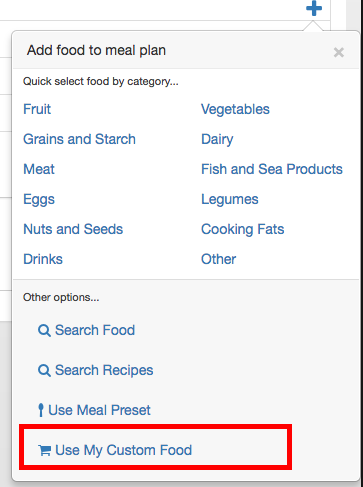 NutriAdmin uses a food database provided by the US Department of Agriculture that contains tens of thousands of food items. Even though these are a lot of products, you may not be able to find items that fall into the categories listed above. 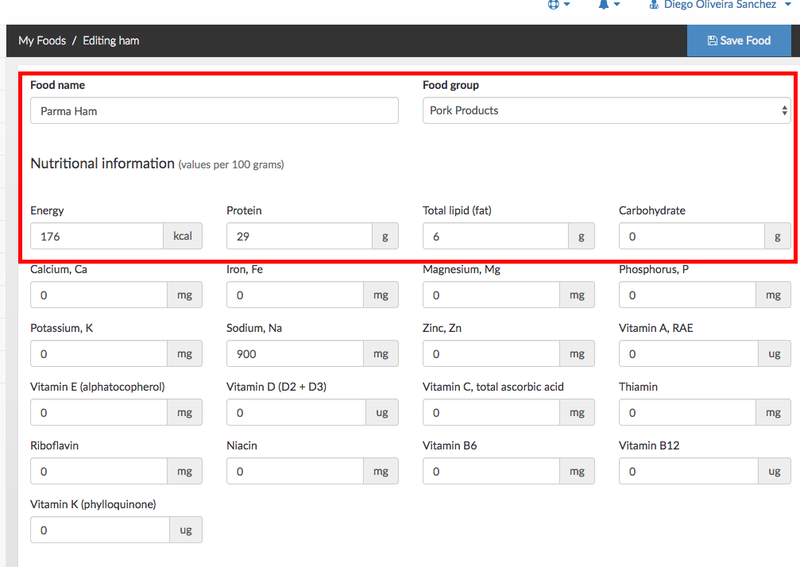 To alleviate this problem, NutriAdmin allows you to create your own foods. Step 1: Click on Recipes & Foods on the left menu. Then select the My Foods tab. Step 2: You will see a list of your existing food products. You can view, edit, and delete any of them at any point. To create a new food item, click on New Food on the top-right corner of the screen. Step 3: Populate the fields for your new food product. The fields marked in red on the screenshot below are mandatory. These include: food name, group, energy, protein, fat, and carbohydrate. It should be noted that nutrient values are measured per hundred grams. Micronutrient values can be left blank, and the system will populate them as 0. It is recommended though that you include any important micronutrient information for the food products you are creating, as the data you enter here will be used when creating a meal plan or recipe later. You can change which nutrients are available when creating a food. For instructions on how to do so, check this other article. When you are done editing the different fields for your food item, click on Save Food on the top-right of the screen. The system will prompt you to correct any errors in case the form you filled in incomplete. Step 4: You can click on My Foods on the right menu again after saving your new food if you want to check all your products, or add another food (repeating steps 1–3). Next time you are creating a meal plan or a recipe, you will have the change to select Use My Custom Food as an option when adding a new food. 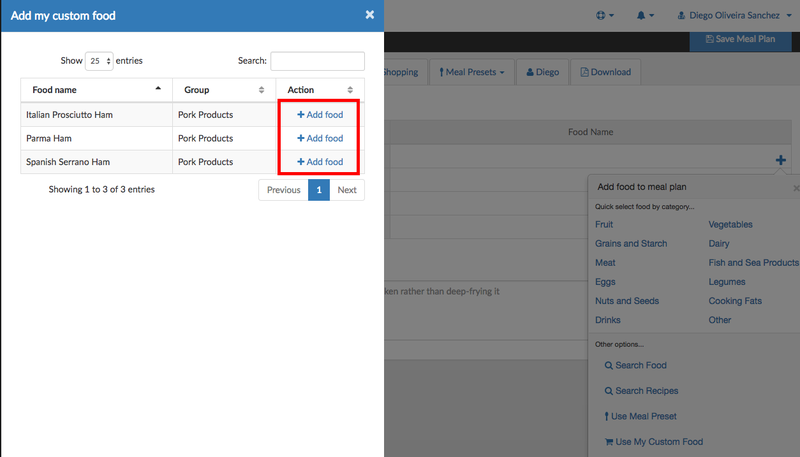 Clicking this button will open a panel where you can select your existing food products. The nutritional content you entered when creating your food will be used in calculations, so you should ensure information is accurate. You can search and sort on the table of available foods if your own collection is large.